It was a busy weekend in Texas as the 2011 Drum Corps International Tour got underway with two huge events in the Ft. Worth and Austin areas. 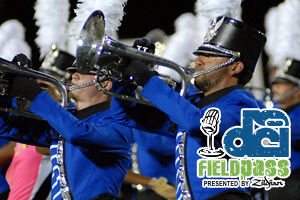 In today's Field Pass presented by Zildjian, Dan Potter recaps all of the action in interviews with Cadets Director George Hopkins and the Blue Devils' Dave Gibbs, and also fills us in on some last minute details about the 2011 Tour Premiere which comes to more than 400 movie theaters nationwide today at 6:30 p.m. local time. Download and listen. (MP3, 7:51, 7.2 MB) Have a Field Pass question, comment or request? Leave a message for Dan Potter by phone at 317.275.1212 x40 or by e-mail at fieldpass@dci.org. Subscribe to this podcast through iTunes. Become a fan of the Field Pass on Facebook. Visit Zildjian.com. Field Pass archive.